This is my “Autumn Explosion” quilt that was on display last weekend at Quilts at the Creek. I started this quilt in a class with Jan Krentz in February 2010 and it’s based on her “Summer Salsa” quilt in the book “Lone Star Quilts and Beyond“. I did change the corners to New York Beauty blocks that I designed in Electric Quilt. I actually finished the quilt top at a retreat in April of 2010, but it hung in my cupboard for 3 years because I wasn’t sure how I wanted to quilt it! 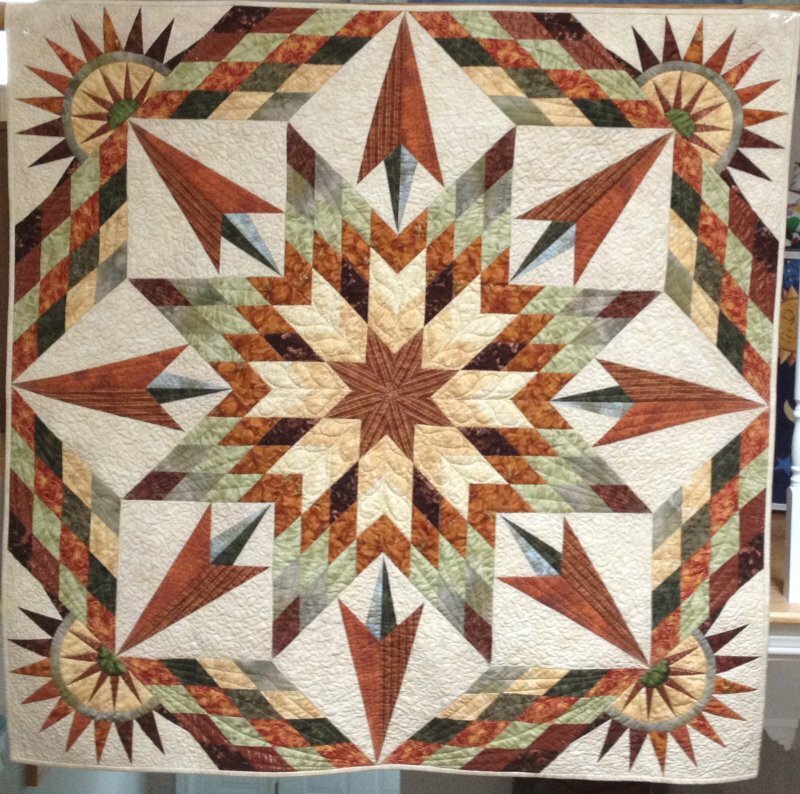 York Heritage Quilters’ Guild has a challenge every couple of years called TGIF (Thank Goodness it’s Finished! ), so I decided to enter this quilt in the May 2013 TGIF challenge to inspire me to finish it. Always working better under pressure, I finished quilting it on the Thursday before our Victoria Day long weekend, just before the May guild meeting on Tuesday. I used Superior Metallic thread to stitch in the ditch around the diamonds, rockets and star-bursts, and also do straight line stitching in the rockets and diamonds. I used a Marathon rayon thread to do the stippling and short feathers in the center. That night, I decided to block the quilt before attaching the binding, to aid in getting it to lay flat (since the diamonds make the edges on the bias). I used Ricky Tim’s method of sticking the quilt in a washing machine full of water, then spinning out most of the water, and laying it flat to dry (the use of fans blowing over top of the quilt helps to speed up the drying process). Conveniently, it fit on the top of my ping-pong table so it was easy to spread out flat. Unfortunately, in the morning I realized that the brown patches on the neutral fabric that I thought were just wet spots were actually some bleeding of the brown fabric that I’d used for the backing, even though the brown fabric had been pre-washed. I didn’t have time to try and wash it again that day, since we were leaving for the cottage, but I did attach the binding so that I could do the hand stitching and bury all of the thread tails over the weekend. When I got home on Monday, I used Oxy-Clean to scrub at the brown stains, then washed the quilt with a bunch of Shout Color Catchers. Luckily, the stains did come out, and after blocking the quilt overnight again, it was ready to display at the TGIF challenge that evening. It even won a ribbon for second place in the Viewer’s Choice Awards! Next time, I’ll remember to put the Color Catchers in the wash the FIRST time I wash the quilt, and hopefully won’t have the panic attack! I just wish that they were available in Canada. They seem to be in all grocery stores in the USA. One vendor at a quilt show I attended in the spring had them for sale, but they were charging twice the price that I’ve paid in the USA. This entry was posted in Free Motion Quilting, Quilting. Bookmark the permalink.